Carrying on from yesterday’s 2010 in Review, I’ll now lay out my predictions for this year and see how well last year’s stacked up to reality. (1) Last year, I wrote: “World economy continues an anemic recovery, though there are significant risks to the downside.” Today I’d repeat this, but add that the risks have heightened. Many countries in the developed world, from Spain to the US, now run patently unsustainable fiscal policies. I don’t know when the bond vigilantes would strike (and even if I did I’d rather get rich than tell you), but sooner rather than later they will. The obvious loci of the next big crisis are the so-called “PIGS” (Portugal, Italy, Greece, Spain), and Ireland, Belgium and Hungary. But obvious isn’t preordained. Iberia, at least, is covered by the EU’s €440bn rescue fund, while Italy’s 120%-of-GDP debt is counterbalanced with a 0.9 ratio of receipts to outlays (i.e. for every €1 it spends it collects €0.9 in tax). The UK has the worst budget deficit amongst the big European countries, but it’s insulated by an average debt maturity of 14 years. Japan has the most apocalyptic sovereign debt figure at 220%-of-GDP, but also has immense foreign savings. Finally, though the US appears to be in one of the worst positions all round, with an debt maturity of just 4 years, a 0.6 receipts to outlays ratio and an ideological rift that precludes a political solution, it is still buffered by the $’s status as the global reserve currency. Which of these dominoes will fall first, and when, must remain a matter of speculation, and may ultimately be contingent on unforeseeable shocks and triggers. For instance, a damning Wikileaks expose of Bank of America? Iran blocking the Strait of Hormuz in response to an Israeli strike (as I speculated here)? It’s all possible. (2) Possible wars. My analysis remains the same as last year’s, with two changes: (1) The likelihood of a US/Israeli strike against Iran rises from 25% to 40% because the Stuxnet worm can not longer be relied upon to sabotage Iranian nuclear progress, the US development of the MOP, and Obama’s domestic weakness in light of the GOP’s resurgence; (2) The chance of an Azeri-Armenian war over Nagorno-Karabakh has risen from small to 10% in view of heightened rhetoric, skirmishes and exploding Azeri military spending. (3) My Russia predictions. Back on October 8th, I predicted: “Within the next 3 months Luzhkov is going to get hit with corruption charges and will either go on trial or seek political asylum in the West.” Still more than three weeks to go! Barring another catastrophic heatwave or natural disaster, Russia’s population should resume growth in 2011 (as in 2009, but probably will just miss out in 2010). The life expectancy should approach (or slightly exceed) 70 years; the total fertility rate will approach (or exceed) 1.6 children per woman; the birth rate will be in the 12.5-13.0 / 1000 and the death rate in the 13.5-14.0 / 1000 range. The justifications for these predictions should be well-known to S/O readers but for refreshers see here and here. Consensus is that the Russian economy will growth by 3.5-5.5%. This will be lower if there is a second global financial crisis, but the results on growth are almost certain to be far less severe than in 2009 (-7.9% growth) because today’s Russia Inc. is much less dependent on foreign credit inflows. See Russia 2010: Growth but state-led recovery is bad news by Ben Aris. In foreign policy, expect relations with the US to deteriorate, on account of the rise of hardline Russophobes amongst Republican Representatives. On the other hand, the France-German bloc – increasingly estranged from the Mediterranean South – will be more willing to engage Russia’s non-indebted, growing and expanding (see Kazakhstan & Belarus customs union) markets. (4) US politics will be mired in domestic issues, with Republicans doing their utmost to hack away at the healthcare legislation, calling for cuts to social (but not security) spending, harassing the EPA, and perhaps even trying to shut down government around March. The joblessness of the recovery and dim economic prospects will dim Obama’s political prospects, but they may be just about rescued if the Republicans overreach themselves. I think the ConDem coalition in the UK will last the year, albeit with a lot of acrimony and backstabbing. The Lib Dems have lost half their electoral support, the students whom they betrayed, so they’ll want to hang in with the Tories as long as possible. (5) Oil prices should stay at around $80-120 in 2010 and production will remain roughly stable as increased demand (from China mostly) collides with geological depletion. If there is a second global economic crisis, I doubt we’ll see prices plummeting to $40 as we did in early 2009, when investors abandoned stocks and commodities for the perceived safety of bonds. But since the next big crisis will probably be a bonds crisis, the most attractive safe havens may well become commodities, and the government bonds of emerging markets (where commodity consumption is rising). (6) China will continue growing at 8-10% per year. Their housing bubble is a non-issue; with 50% of their population still rural, it isn’t even a proper bubble, since eventually all those new, deserted apartment blocs will be occupied anyway. What is of concern is that China’s coal production – now almost 50% of global production – is close to plateauing. This is of some consequence given that coal is China’s primary energy driver. (7) Despite NASA reporting that 2010 may be the hottest year on record, the thermometers may break limits again in 2011. That is because, despite the unprecedented temperatures – manifesting in a great Russian heatwave that destroyed 40% of its grain crops and flooding in Pakistan that displaced millions – 2010 actually correlated to the end of a minimum in solar irradiance. 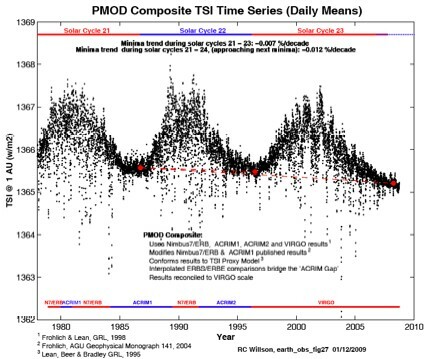 Solar irradiance has a forcing effect on global temperatures, independent of the secular rise in atmospheric CO2. Based on the graph above, we can expect another peak in the next few years. Since greenhouse emissions continue unabated and are indeed joined by feedback emissions such as methane from melting Arctic permafrost, we can confidently expect several major climate events this year. Speaking of the Arctic, as its longterm ice volume continues to plummet and sea ice extent retreats, we can expect more circumpolar shipping. I wouldn’t be surprised to see up to 10 non-stop voyages along the Northern Sea Route from Europe to China, following just one by MV Nordic Barents in 2010. Likewise, expect the Arctic to become a major locus of investment – if not in 2011, then in a few more years – as lucrative companies and ports are privatized in Arctic Russia. (8) Wikileaks will not be “shut down”, as the Internet is too resilient. If Assange is successfully extradited to the US to face espionage or computer misuse charges – I’d give a 50% chance of that happening – then expect fireworks to go off as the “insurance file” is released. What about the 2010 Predictions? 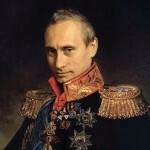 Consider this post on 2010 predictions and my prediction of the 2010 Ukrainian elections. (1) “World economy continues an anemic recovery”: mostly true, though I should have clarified that I was referring to the developed countries. Though some, like Germany, did really well. (2) “Republicans will carry the mid-term elections in 2010, but there is a strong mood of apathy and a sense that what is really needed is a new party, a new politics“: Bingo! Republicans won – check. Social disillusionment – check Gallup. A new party, a new politics – the Tea Party. “Rising violence in Iraq… a false quiet in Afghanistan”: Got them wrong way round. (3) None of the wars I mentioned happened, but I didn’t necessarily expect them to, as all of them were given as probabilities. (4) “[Russia’s demography will] continue improving further in 2010 and that the year will see the first year of positive population growth since 1994 (or 2009)… Birth rate = 12.5-13.0 (reasons), Death rate = 13.5-14.0 (a reason), Net Migration = 1.5-2.0, all / 1000.”: The Great Russian Heatwave of 2010, causing 44,000 excess deaths, threw many of my predictions off kilter. For now I’m basing it all on Jan-Nov 2010 stats, as December isn’t in yet. The birth rate during this period rose from 12.4 / 1000 to 12.6 / 1000, so I got that right. Unfortunately, the death rate rose from 14.1 / 1000 to 14.4 / 1000, due to an extra 28,300 deaths; if we exclude the 44,700 excess deaths accruing to the heatwave, the death rate would have been 14.0 / 1000, and so just within predicted range. A substantial falloff in net immigration, which I didn’t expect – surely more people should have left during the recession? – means that Russia’s population growth will almost certainly dip into negative territory this year. “Economic growth of around 3-5% of GDP sounds reasonable.”: Most estimates are now converging at around 4%, so completely correct. “Lots of privatizations and corruption investigations as part of the Surkov clan’s struggle against the siloviki and “their” state companies.”: True for the first part; not so much for the second, as most efforts have instead been diverted to ousting the last 1990’s-vintage regional barons. “Yushenko will almost certainly (95%+) be kicked out of the Presidency in the coming Ukrainian elections… Ukraine under Yanukovych will join Eurasec or the Russia-Belarus-Kazakhstan customs union, but is yet unlikely to join the CSTO or give Russian 2nd language status.”: Correct; wrong & wrong; right & right. I still expect Ukraine to join a Eurasian common economic space. As George Friedman points out in his “geopolitical journey” (see the part “European Dreams”), the Kiev intelligentsia has little sense of national identity, and dream of a Europe whose foundations are in fact crumbling let alone considering further expansion. By far the most logical alternative for Ukraine, in the long-term, is something resembling what it has been since 1654. In late January, 2010: “Adding up these figures, Yanukovych gets 50% of the votes, whereas Tymoshenko gets 46%… It is safer to say that Yanukovych will win with a gap wide enough that Tymoshenko will not have grounds to make a legal wrangle out of it – though that is just about possible if she’s very lucky and comes within 1-2% points of Yanukovych. But my prediction is a Yanukovych win by 5-10% points over Tymoshenko”: During the second runoffs on February 7th, Yanukovych got 48.95% and Tymoshenko got 45.47%, making a gap of 3.5%. My first, allegiance-tallying method was virtually perfectly correct (50%-46%); the one that involved factoring in opinion polls led me to miss my mark. But nonetheless, I still ended up predicting the correct result. (5) “Oil production in 2010 will be around the same as 2009 – increased demand will collide with geological depletion to keep output stable. Oil prices in H1 will remain at 70-90$, and will rise to 90-110$ in H2”: More accurate to say $70-90 for the whole year with dips and rises, but you wouldn’t have lost money taking my advice (and that after making big bank in 2009: “…a rebound in oil prices from around 40-50$ per barrel in the first half, to 60-80$ in the second”). “AGW skepticism will become more popular in the wake of Climategate“: Yes – see the Republican Party. “China and its proxies will prevent any more significant action being taken at the next UN climate change summit in Mexico, than was “achieved” in Copenhagen”: Correct, though actually it was the entire world (save a few countries like Bolivia), not just China, that colluded in making a worthless agreement. “By year-end the performance of the world’s top supercomputer will exceed 3 petaflop/s (repeat of 2009 prediction)”: Still not there, as the current top supercomputer, the Chinese Tianhe-1A, achieved a performance level of 2.57 petaflop/s. Next year for sure though. (7) “China’s growth will slow from around 8% in 2009, to perhaps 5% in 2010… expect China to continue keeping a low profile as the US insists on shooting itself in the foot.” So wrong! Ouch. * EDIT. A reader wrote in to tell me I meant David Cameron is the leader of the Tories, even though James (the film-maker) might be preferable. LOL. For me to get it wrong not once (when writing) but twice (when reading) there must have been some serious Freudian slippage going on!